To know the context of what follows start with the overview here, and for reference list of personalities involved here. The urgency of inducing Sherif Hussein and his sons to enter the war – even if they provided only a minor distraction to the Turks and a small symbol of Allied Muslim cooperation to the world at large – was now becoming acute. The war with the Ottomans was not going well – and not just at Gallipoli. The Bedouin tribes who had rallied to Husayn and his sons – mainly the Juhayna, Harb and ‘Utayba – were not jihadi warriors against an alien invasion like the Arabs of Iraq. Many of them heartily disliked the Turks and their railway to Medina; but they were essentially mercenaries, fighting for British-supplied gold and modern rifles. As for their martial qualities, individually they could be courageous, but up against regular troops – especially when these were equipped with modern weaponry – they had a tendency to become disorganized and panic. More- over, each tribe was reluctant to move outside its own dira – its traditional zone of pasturage, water rights and oasis gardens. Worse still, some tribal leaders soon showed that their loyalty could not be relied upon when the Turks made them offers of cash which exceeded those of Hussein. Showing things were not going to well, Britain’s defeat at Gallipoli was followed by an even more devastating setback in the war against the Ottomans. By mid-April 1916 it had become clear that all attempts to relieve the siege of Kut had failed. Negotiations on surrender began on 27 April, during which Townshend, with Kitchener’s approval, offered Khalil Pasha all his artillery and £1 million in return for his men being allowed to leave Kut on parole. Khalil immediately referred the offer to his uncle, Enver Pasha, who replied, ‘Money is not wanted by us.’ Townshend then raised the cash offer to £2 million but, insulted by what they considered an attempt to bribe them, Khalil and Enver declined once again. Realising at last that the Turks were intent on unconditional surrender, Townshend resigned himself to the inevitable and on 28 April began destroying his guns. There was little mercy for the British and Indian ‘other ranks’ or the local Arab population after the Turks entered Kut. Hangings and torture were the lot of those Arabs who were deemed to have collaborated with the British, and the prisoners themselves were dispatched on a veritable death march to Anatolia, where the survivors were condemned to forced labor. Around two-thirds of the British and Indian troops who surrendered died of disease or maltreatment. General Townshend, on the other hand, was taken to Istanbul, where he lived out the rest of the war in pleasant semi-confinement, convinced to the last that the Turkish commanders were ‘Gentlemen’. For Britain’s war leaders, one defeat by ‘orientals’ had been shocking; two defeats seemed utterly appalling. As far as the war in the East was concerned, there was now ‘only one show in town’ – the revolt against the Turks by Sherif Hussein and his men. Fortunately, current and future promises of gold in very large quantities were about to produce the desired outcome. On 5 June 1916 Kitchener, the architect of the ‘Eastern Strategy’, whose vaguely worded message to the Sherif in September 1914 concerning the caliphate had set in motion the train of events which had since unfolded, drowned in the icy waters of the North Sea whe the cruiser HMS Hampshire carrying him on a diplomatic mission to Russia was sunk by a German submarine. On the very same day, as we have seen, Husain’s sons ‘Ali and Faisal raised the banner of revolt at Medina and five days later the Sharif himself joined the rebellion, having previously been promised a subsidy of £50,000 per month in gold sovereigns, 5,000 rifles and a quarter of a million rounds of ammunition by decision of the British cabinet, a figure which would be raised to £125,000 in gold a month later, and eventually rise to £200,000 per month by mid-1917. Below General Townshend with Khalil Pasha on the right. Today Prime Minister mentioned to me desirability of making your operations as successful as possible. I am in entire agreement. Wire précis of action proposed beyond El Arish, stating what additional troops you would require for advance if any. I cannot help thinking that in view of importance of achieving big success on Eastern front, and the effects this will have, you might risk having fewer troops on Western [the Egyptian western front; R.H.L.]. A success is badly needed, and your operations promise well. Murray interpreted ‘beyond El Arish’ rather liberally. In his reply, he observed that he had ‘always thought important results might be secured by an advance by us from Arish into Syria’. The best thing to do after the occupation of Rafa was to attack Beersheba, ‘where enemy’s main concentration appears to be’. From Beersheba, moreover, Murray’s aircraft were able to attack the Hijaz railway, while the occupation of that town ‘would result in a rising of Arab population in southern Syria, who are known to be very disaffected towards Turks’. If his operations progressed as he hoped, he would need, however, two extra divisions on a temporary basis, perhaps from Mesopotamia, as Sir Archibald fully realized the ‘undesirability of taking troops from main theatre’. 1. The C.P.O. will act as adviser to the G.O.C. on political relations with native elements in the theatre of operations of the G.O.C. in C. Egypt beyond the Egyptian frontier. 2. The French Commissioner is accredited to the G.O.C. in C. Egypt as the political representative of the French government in all negotiations that may be necessary in the theatre of operations of the Egyptian force beyond the Egyptian frontier. 3. The G.O.C. will communicate with the French Commissioner through the C.P.O. and the French Commissioner will communicate with the G.O.C. through the C.P.O. 4. The G.O.C. will use the C.P.O. or his delegate, and the French Commissioner or his delegate, as his joint representatives in negotiations between the representatives of native elements in areas A and B and himself. 5. The French Commissioner or his delegate will act alone, and on his own responsibility, in any negotiations with native elements in the Blue area subject to the exigencies of the military situation for which the Military Commander alone is responsible. He will keep the G.O.C. apprised of all these negotiations through the medium of the C.P.O. But, in the event of any part of the Blue area coming within the theatre of operations of the Egyptian Force, the French Commissioner will act jointly with the C.P.O. in negotiations with native elements inhabiting that part of the area. 6. The French Commissioner and the C.P.O. will act jointly in any communications that may be necessary with the King of the Hedjaz, but through the medium and with the approval of the High Commissioner in Egypt, G.O.C. in the Hedjaz. 7. The C.P.O. will keep the French Commissioner apprised of any negotiations with the military or political officers with the Mesopotamian force may enter into with native elements in area A. 8. With regard to the Brown area, no political negotiations shall be directly entered into with native elements in this area until it is actually occupied. Representatives of many shades of Arab opinion in Cairo […] but none of them are men who could do more than give a guide as to the sentiments of the party to which they belong, nor could they speak with any authority or as representatives. Moreover, none of these men are sufficiently influential to sit as delegates without exciting jealousy and opposition among their colleagues and rivals. Clayton also sent a copy of his note to Cyril Wilson. In his covering letter he observed that, as far as the Sykes– Picot agreement was concerned, it was ‘difficult to decide, on the present slight data, how far, if at all, the Sherif should be informed at the present moment’. It would have been better to delay telling Husayn anything at all, but ‘on the whole’ Wingate considered that: The Sherif should be told in general terms of what is contemplated and the following is the formula which he would like you to adopt in conveying this information to the Sherif. ‘H.M.G. agreed with the French government to send to Egypt within a month or six weeks, a joint commission to discuss and examine the question of the eventual settlement of the Arab territories of the Ottoman Empire when the Turks have been finally defeated and expelled from those territories. For this purpose H.M.G. and the French government have each detailed a Commissioner to proceed to Cairo’. It appears fairly obvious that the Sherif thinks the Commission will deal with the future of Syria etc., and I understand from your secret private letter of 10th March that this is really the case and if the eventual settlement of the Arab territories of the Ottoman Empire is to be the business of the Commission, I would most strongly urge that the Sherif be taken into our complete confidence and be in- formed of the actual object of the Commission. Considering the EEF’s advance had stopped at the border with Palestine, it seemed that Clayton’s and Wilson’s worries were purely academic, but this might change if Sir Archibald’s plan for a coup de main on Gaza was successful. The capture of that town was very desirable with an eye to the coming autumn offensive. The chances that such an operation would succeed considerably increased when on 15 March the Turkish Eighth Army abandoned the last forward position from which it could have threatened the right flank of the EEF, and retreated to the line Gaza–Beersheba. Eleven days later the battle for Gaza began. Would be hailed with the utmost satisfaction in all parts of the country. From this point of view a success in Palestine would have a very considerable importance quite apart from its purely military aspects. There was every probability that in the course of the next few months there would be a very considerable increase in the strain on the people of this country due to the war, and it was of the first importance that there should be military successes to counteract the depressing influences of a difficult economic situation. Nowhere did success appear easier to realize than against Turkey. Some of Sir Archibald Murray’s communications tended to show that in his appreciation of the purely military and strategical aspects of the war, he had rather lost sight of the moral importance of a victory such as he might reasonably hope to achieve in Palestine and Syria. Were agreed on the following points. (1) that they desired that Great Britain and France should be prepared to contemplate the establishment an Arab State or confederation in an area approximating to areas A and B. (2) that such a State or confederation would be obliged to rely on France and Great Britain for de- fence and protection. But you people of Baghdad, whose commercial prosperity and whose safety from oppression and invasion must ever be a matter of the closest concern to the British government, are not to understand that it is the wish of the British government to impose upon you alien institutions. It is the hope of the British government that the aspirations of your philosophers and writers shall be realised and that once again the people of Baghdad shall flourish, enjoying their wealth and substance under institutions which are in consonance with their sacred laws and racial ideals. 1. That, unless Arab independence is assured, he feared that posterity would charge him with assisting in the overthrow of last Islamic power without setting up another in its place. His Majesty, the King of the Hedjaz, learned with satisfaction that the French government approve Arab national aspirations that as he had confidence in Great Britain he would be content if French government pursued same policy towards Arab aspirations on Moslem Syrian littoral as British did in Bagdad. According to Sir Mark, Georges-Picot received this statement ‘very well and relations became cordial’. Special representatives of Great Britain and France came expressly to fix things up with the Sherif and when the latter agreed to France having the same status in Syria as we are to have in Iraq surely the main points of our agreement re Iraq should have been stated to prevent all chance of a misunderstanding which might have far reaching consequences. 1. That the Sherif agreed to France in Syria being in same position as we in Iraq. On 5 June 1917, the Foreign Office recalled Sykes, and two days later the French government was requested to do the same with Georges-Picot (see Chapter 8, section ‘The Failure of the “Projet d’Arrangement”’).58 The Sykes–Picot mission had come to an end, even before Sykes and Picot had been able to occupy themselves with its primary objective; that is, to advise Murray on ‘political relations with native elements’, as well as in ‘all negotiations that may be necessary in the theatre of operations of the Egyptian force beyond the Egyptian frontier’. It was in order to facilitate the achievement of this objective that Sykes and Georges-Picot had desired that three to five ‘delegates’, and a representative of King Hussein would be attached to their mission. However, the EEF’s defeats at Gaza, together with the fears the authorities in Cairo entertained as to the possible adverse effects the mission might have on the Arab nationalist movement, saw to it that, once in Egypt, the mission’s objective changed completely. At the onset it was, above all, intended as an instrument to ease Franco–British relations with respect to the Middle East. As Sykes had explained to Wingate, his ‘main job (was) to keep the Franco–British situation clear’. The forced inactivity resulting from the failure of Murray’s offensive, however, meant that Sykes and Georges-Picot had all the time in the world to busy themselves with other matters, such as trying to meet the objections others entertained with regard to their mission. 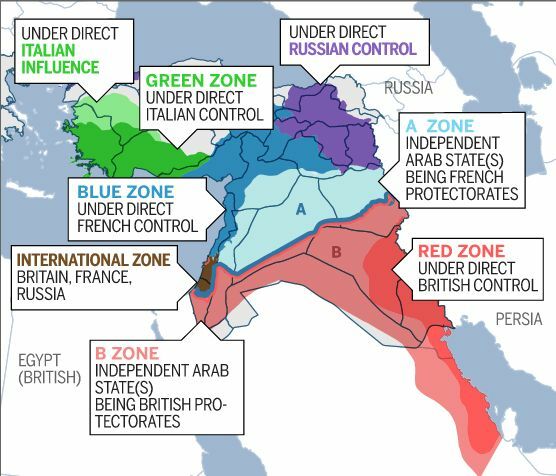 The Sykes– Picot memorandum of 17 May, which dealt with the necessity to maintain close British–French cooperation in the Middle East, showed that this shift in objectives went almost unnoticed. One of its results was that the Sykes–Picot agreement turned from a guide for discussions with the local population beyond the Egyptian border, into a subject of discussion with the Sherifians and their British advisers, if only to set their minds at ease. Extremely pleased to have trapped M. Picot into the admission that France will be satisfied in Syria with the position Great Britain desires in Iraq. That, he says, means a temporary occupation of the country for strategical and political reasons (with probably an annual grant to the Sherif in compensation and recognition) and concessions in the way of public works. In conclusion the Sherif remarked on the shortness and informality of conversations, the absence of written documents, and the fact that the only change in the situation caused by the meeting was the French renunciation of the ideas of annexation, permanent occupation or suzerainty of any part of Syria – ‘but this we did not embody in a formal treaty, as the war is not finished. I merely read out my acceptance of the formula “as the British in IRAQ” proposed to me by M. Picot, since Sir Mark Sykes assured me that it would put a satisfactory conclusion to the discussion’. Able to state definitely that more is required to replace the former Turkish subsidy that he received and that it is essential for the upkeep of the holy places and the pilgrimage, we would be ready to meet his views on these lines and to give him additional money for these purposes. Matters have considerably progressed in Hedjaz. Shereef’s prospects of ultimate success have greatly increased and in like ratio wide importance to us of his success and necessary measures to ensure have also increased. I beg that I may be authorised to substitute […] for words ‘for a period of 4 months’ the words ‘for the present’. Clerk considered that this request was ‘difficult to refuse’, and Hardinge agreed. On 10 April 1917, Wingate telegraphed to the Foreign Office that Hussein had requested that his monthly subsidy be raised. According to the high commissioner, the king deplored the fact that he had to make this request, especially in view of ‘his heavy financial and other obligations to His Majesty’s Government’, but then again, from his revolt ‘serious political and military benefits’ had accrued to Great Britain. Sir Reginald added that Hussein would use the extra money ‘to secure the adhesion of chiefs of northern tribes and thereby to achieve that semblance of national cohesion which can (?justify) his revolt […] in the eyes of the Moslem world’. In view of the latter, in particular, it seemed to Wingate to ‘be bad and possibly dangerous policy on our part to withhold additional financial backing which he requires at a time when tribal elements east of the Jordan can render effectual assistance to our own military operations in Palestine’. He therefore did not hesitate to recommend strongly the granting of Hussein’s request. At the Foreign Office, Oliphant minuted that ‘in view of the present situation it would, I submit, be unwise and an expensive economy, not to meet this request’. Hardinge concurred: ‘the Shereef’s success has so far been very cheap at the price, and as there is every likelihood of his achieving further successes we should press for further financial assistance for him’. Lord Robert Cecil agreed ‘entirely’. 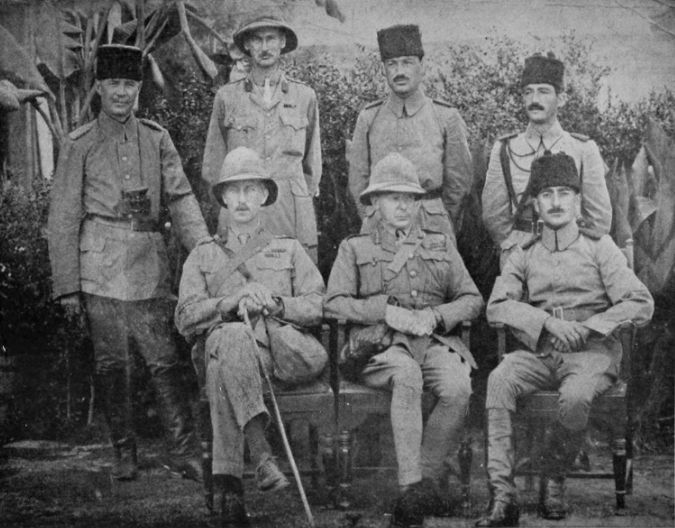 The ‘Arab revolt’, Britain, and the Collapse of the Ottoman Empire in the Middle East. Mark Sykes returned to England where, almost immediately, he was thrust into negotiations with M. Charles François Georges-Picot, French counselor in London and former French consul general in Beirut, to try to harmonize Anglo-French interests in ‘Turkey-in-Asia’. Picot on the other hand had ‘expressed complete incredulity as to the projected Arab kingdom, said that the Sheikh had no big Arab chiefs with him, that the Arabs were incapable of combining, and that the whole scheme was visionary. 'The Arab question and the ‘shocking document’ that shaped the Middle East. 1. Wingate to Hogarth, private, 5 July 1916, Wingate Papers, box 138/3. 2. Tel. McMahon to Grey, no. 945, 31 October 1916, FO 371/2782/218006. 3. Tel. McMahon to Grey, no. 947, 31 October 1916, FO 371/2782/218629. 4. Tel. Wingate to McMahon, no. 628, 2 November 1916, FO 371/2782/221025. 5. Tel. McMahon to Grey, no. 947, 31 October 1916, FO 371/2782/218629. 6. Tel. McMahon to Grey, no. 961, 2 November 1916, FO 371/2782/220339. 7. Tel. Wingate to McMahon, no. 628, 2 November 1916, FO 371/2782/221025. 8. Tels McMahon to Grey, no. 961, 2 November 1916, and Wingate to McMahon, no. 628, 2 November 1916, FO 371/2782/220339. 9. Tel. McMahon to Grey, no. 955, 1 November 1916, and minute Clerk, 2 November 1916, FO 371/2782/219490. 10. Minute Clerk, 3 November 1916, on tel. McMahon to Grey, no. 967, 3 November 1916, and tel. Grey to McMahon, no. 880, 3 November 1916, FO 371/2782/220832. 11. See tel. McMahon to Grey, no. 980, 7 November 1916, FO 371/2782/223715. 12. Tel. Grey to Wingate, no. 6, 6 November 1916, FO 371/2782/221869. 13. Tel. Grey to Wingate, no. 13, 13 November 1916, Wingate Papers, box 143/1. 14. Tel. Grey to Wingate, no. 21, 24 November 1916, FO 371/2782/234461. 15. Tel. Balfour to Wingate, no. 35, 11 December 1916, FO 371/2782/246846; cf. also Dan Eldar, ‘French Policy towards Husayn, Sharif of Mecca’, Middle Eastern Studies, 26 (1990), p. 341. 16. Robertson, El Arish Operations, 14 December 1916, and minutes War Cabinet, 15 December 1916, Cab 23/1. 17. Anglo–French conference, minutes of a meeting, 28 December 1916, I.C. 12, Lloyd George Papers, F/120/2. 18. Hankey diary, 11 December 1916, Hankey Papers, vol. 1/1. 19. Tels C.I.G.S. to G.O.C.-in-C., Egypt, no. 26174, 9 December 1916, G.O.C.-in-C., Egypt to C.I.G.S., no. A.M. 1380, 10 December 1916, G.I.G.S to G.O.C.-in-C., Egypt, no. 26289, 12 December 1916, G.O.C.-in-C., Egypt to C.I.G.S, no. A.M. 1389, 13 December 1916, and C.I.G.S. to G.O.C.- in-C., Egypt. no. 26624, 15 December 1916,WO 33/905. See also Murray’s discussion of these telegrams in his Sir Archibald Murray’s Despatches (London, 1920: Dent), pp. 130–1. 20. Robertson, ‘NOTE ON A PROPOSAL TO UNDERTAKE A CAMPAIGN IN PALESTINE DURING THE WINTER WITH THE OBJECT OF CAPTURING JERUSALEM’, 29 December 1916, WO 106/310. 21. Minutes War Cabinet, 2 January 1917, Cab 23/1. 22. See minutes War Cabinet, 31 January 1917, ibid. 23. Status and functions of Chief Political Officer and French Commissioner, encl. in Graham to Hardinge, 13 February 1917, Hardinge to Balfour, 14 February 1917, and minute Balfour, not dated, FO 371/3050/56041. 24. Sykes to Wingate, 22 February 1917, Wingate Papers, box 145/2. 25. Clayton, Note on telegram no. 219 from the Foreign Office to the High Commissioner dated March 6th 1917, 10 March 1917, FO 882/16. 26. Tels Wingate to Balfour, no. 257, 12 March 1917, and Balfour to Wingate, 14 March 1917, FO 371/ 3045/53249. 27. Clayton to Wilson, 10 March 1917, FO 882/16. 28. See Arbur to Wilson, no. A.B. 003, 16 March 1917, ibid. 29. Tels Wilson to Arbur, no. W. 609, 17 March 1917, Wilson to Arbur, no. W. 610, 17 March 1917, and Arbur to Wilson, no. A.B. 024, 18 March 1917, ibid. 30. Wilson to Clayton, 21 March 1917, and P.S., 22 March 1917, FO 882/12. 31. See tel. G.O.C.-in-C., Egypt to C.I.G.S., no. O.A. 377, 28 March 1917, WO 106/1512. 32. Minutes War Cabinet, 30 March 1917, Cab 23/2, see also Matthew Hughes, Allenby and British Strategy in the Middle East 1917–1919 (London, 1999: Frank Cass), pp. 19–20. 33. Tels C.I.G.S. to G.O.C.-in-C., Egypt, no. 31854, 30 March 1917, and G.O.C.-in-C., Egypt to C.I.G.S., no. A.M. 1749, 31 March 1917, in Lieut.-General Sir George MacMunn and Captain Cyril Falls, Military Operations Egypt & Palestine from the Outbreak of War with Germany to June 1917 (London, 1928: H.M. Stationary Office), pp. 322–3. 34. See tel. C.I.G.S. to G.O.C.-in-C., Egypt, no. 31898, 31 March 1917, and tel. G.O.C.-in-C., Egypt to C.I.G.S., no. A.M. 1751, 1 April 1917, WO 106/ 1512. Lloyd George blamed Murray personally for the EEF’s defeat at Gaza. On 5 June, the War Cabinet appointed Lieut.-General Sir Edmund Allenby as Murray’s successor. Allenby took over on 29 June 1917. Minutes War Cabinet, 5 April 1917, Cab 23/13, and 5 June 1917, Cab 23/3. 35. Minutes War Cabinet, 2 April 1917, Cab 23/2. 36. A complaint that Curzon time and again voiced in Sykes’s presence, witness the latter’s complaint that Curzon ‘never ceases twitting me with having given everything to France’. Sykes to Drummond, 20 July 1917, Sykes Papers, box 2. 37. Notes of a conference, no. G.T. 372, 3 April 1917, Cab 24/9. 40. Clayton to Wilson, 28 April 1917, FO 882/12. 41. Tel. Wingate to Balfour, no. 464, 27 April 1917, FO 371/3054/86526. 42. Wingate to Graham, private, 28 April 1917, Wingate Papers, box 145/5. 43. Clayton to Wilson, 28 April 1917, FO 882/12. 44. See tel. Balfour to Wingate, no. 442, 28 April 1917, FO 371/3054/86526. 45. See Clayton to Wilson, 28 April 1917, FO 882/12. 46. See Roger Adelson, The Formation of British Policy towards the Middle East, 1914–1918 (Ann Arbor, 1973: unpublished dissertation), pp. 220–8, 318–19; Briton Cooper Busch, Britain, India, and the Arabs 1914–1921 (Berkeley, 1971: University of California Press), pp. 110–20, 135; Basil Liddell Hart, History of the First World War (London, 1972: Pan Books), pp. 269–73. 47. Tel. S.S.I. to viceroy, 12 March 1917, FO 371/ 3042/56627; see also minutes War Cabinet, 12 and 14 March 1917, Cab 23/2. 48. Clayton to Wilson, 28 April 1917, FO 882/12. With respect to Sykes’s instructions, see tel. Wingate to Balfour, no. 472, 28 April 1917, and tel. Balfour to Wingate, no. 446, 30 April 1917, FO 371/3054/87289. 49. Tel. Wingate to Balfour, no. 496, 7 May 1917, FO 371/3054/93325. 50. Tel. Sykes to Graham, 24 May 1917, FO 371/ 3054/104269. Shortly afterwards, Faysal complained to Lieut.-Colonel Stewart Newcombe whether the British government intended ‘TheArab Kingdom to be weak and die out? as must be the case if they have no port and was that the reason they allowed all the coast to France? […] certainly the large number of persons hanged in Syria and the Lebanon had not died to liberate their country from the Turks to give it to the French.’ Newcombe, Note, 20 May 1917, encl. in Wilson to Clayton, 24 May 1917, FO 882/16. 51. Sykes and Georges-Picot, ‘Observations on Arabian Policy as results of visit to RED SEA PORTS, JEDDAH, YEMBO, WEJH, KAMARAN, and ADEN’, 17 May 1917, FO 371/ 3044/120491. 52. Tel. Sykes to Graham, 24 May 1917, FO 371/ 3054/104269. 53. Wilson to Clayton, 24 May 1917, FO 882/16. 54. Tel. Sykes to Graham, 24 May 1917, and minute Graham, not dated, FO 371/3054/ 104269. 55. Wilson to Clayton, 24 May 1917, FO 882/16. 56. NOTE BY SHEIK FOAD EL KHATIB TAKEN DOWN BY LT COL NEWCOMBE, not dated, encl. in Wilson to Clayton, 24 May 1917, ibid. 57. Tel. Wingate to Balfour, no. 472, 28 April 1917, FO 371/3054/87289. 58. See tels Balfour to Wingate, no. 571, 5 June 1917, Balfour to Bertie, no. 1521, 7 June 1917, FO 371/3056/110589. 59. Hogarth, Note on the Anglo–Franco–Russian Agreement about the Near East, 9 July 1917, encl. in D.I.D. to F.O., 13 July 1917, FO 371/3054/138899. 60. Clayton to Sykes, 30 July 1917, FO 882/16. 61. Lawrence, Note, 30 July 1917, encl. in Wingate to Balfour, no. 179, 16 August 1917 (underlining in original), and minutes Clerk, 1 September 1917 and Graham, 13 September 1917, and initials Sykes, FO 371/3054/174974. 62. Tel. McMahon to Grey, no. 517, 30 June 1916, and minutes Hardinge and Grey, not dated, FO 371/2773/126674. 63. Secretary’s Notes of a Meeting of the War Committee, 11 July 1916, Cab 42/16/1. 64. Tels Grey to McMahon, no. 549, 6 July 1916, FO 371/2773/126674, and McMahon to Grey, no. 559, 10 July 1916, FO 371/2773/133650, Secretary’s Notes of a Meeting of the War Committee, 11 July 1916, Cab 42/16/5, tel. Grey to McMahon, no. 570, 12 July 1916, FO 371/2773/133650. 65. Tel. McMahon to Grey, no. 691, 14 August 1916, and minutes Clerk and Hardinge, not dated, and tel. Grey to McMahon, no. 678, 15 August 1916, FO 371/2774/160155. 66. Clayton to Wingate, private, 24 September 1916, Wingate Papers, box 140/6. 67. Tel. Wingate to Balfour, no. 404, 10 April 1917, minutes Oliphant, 11 April 1917, Hardinge and Cecil, not dated, Nicholson, 11 April 1917 and Graham, not dated, FO 371/3048/74596. 68. Waterfield to Nicolson, 19 April 1917, FO 371/ 3048/80878. 69. Tel. Wingate to Balfour, no. 459, 23 April 1917, FO 371/3048/83145. 70. Nicolson, Note, 28 April 1917, and minute Hardinge, not dated, minute Drogheda, 7 May 1917, FO 371/3048/94110. 71. Waterfield to Oliphant, 7 May 1917, and F.O. to Treasury, no. 94668/17, 11 May 1917, FO 371/3048/94668, Treasury to F.O., no. 15699/17, 12 May 1917, FO 371/3048/97135. 72. Tel. Wingate to Balfour, no. 729, 12 July 1917, and minutes Nicolson and Clerk, 13 July 1917, FO 371/3048/137930. 73. Minute Clerk, 10 September 1917, on tel. Wingate Balfour, no. 947, 8 September 1917, FO 371/3048/175896. 74. Tel. Wingate to Balfour, no. 645, 18 June 1917, FO 371/3048/121588, tel. Wingate to Balfour, no. 754, 18 July 1917, FO 371/3048/142636. 75. Treasury to F.O., no. 32359/17, 10 October 1917, FO 371/3048/195477. 76. Tel. Wingate to Balfour, no. 1153, 2 November 1917, and minutes Clerk and Graham, 3 November 1917, FO 371/3048/210013.